When choosing to deviate from the standard American diet and instead follow a plant-based lifestyle, many assume there will be a lack of… things. In the first of our series “So… where do you get your…?”, we will discuss vitamins. Prior to June 2016, I was not taking vitamins. I felt fine, was eating a “balanced” diet, and had a vegan chip on my shoulder that food intake would be sufficient enough to meet my vitamin and mineral needs. I was also an avid runner, just off my first marathon, my body was at its peak. Then, the unthinkable happened… I got a stress fracture in my shin. At this point, my running coach Rita, asked if I was getting enough calcium. UMMM OF COURSE I WAS!..nt. After reviewing my MyFitnessPal food diary, that I was keeping meticulously to make sure I was getting enough calories while training, it revealed I was getting sad amounts of calcium. What a disappointment! The vegan chip on my shoulder was quickly knocked off. My new plan, add tons of food sourced calcium to my diet! I began consuming crazy amounts of fortified plant-based milk. Almond milk with breakfast, almond milk with lunch, almond milk with dinner… this got old… quickly. That is when I decided to buy a supplement. I searched on trusty Amazon and found that Deva has many varieties of vegan vitamins and landed on their Cal-Mag Plus tablets. The bottle calls for 3 tablets per day, so I added this supplement to my daily routine. I took one tablet with breakfast, one with lunch, and on with dinner, sometimes. Often, per my MyFitnessPal food diary, I did not need a 3rd tablet, as I already met my calcium needs for the day. I did notice one thing, shortly after taking the supplement with breakfast and lunch, I would grow a tad sleepy. Funny thing, mag, short for magnesium can make you sleepy!! Now, I take one tablet at night before bed. Not only does it make my bones strong, it helps me get to sleep more soundly! It was not until speaking with friends that I decided taking a multivitamin, was a good decision. Friends scared me with stories that B12, not found abundantly in a vegan diet, deficiency was silent and irreversible. Stating that once damage of deficiency is done, there is no coming back from it. NOTE: I did not look up any information or consult a doctor. I just believed them and acted. Again, I took to Amazon and went with a Deva product, Multivitamin & Mineral Support. I had recovered from my stress fracture in about 3-4 months. I continued to take the cal-mag tablets because I definitely did not want another one. Though things seemed to be going well, I wanted to be sure all my levels were in good standing. During my yearly physical, I had a full panel of blood work done. The results were not that bad. Turns out, I was slightly low in B12 and significantly low in vitamin D. My doctor was not worried and did not associate these almost deficiencies with my plant based diet. Turns out, most people are low in both as sun exposure, due to a million different things is not strong in the northeast, and B12 absorbancy is generally low. Back to Amazon I go…. Life went on and so did my continued education into the world of vitamins. Turn outs me and Vinny both listened to different podcasts, Rich Roll and Joe Rogan, with Dr. Rhonda Patrick and decided to add Omega-3 DHA, essentially algae, to our list of supplements. This is normally found in fish oil and has a wide list of functions in the body. Just when I thought our supplement intake was perfect, Vinny brought Alpha Brain into the mix. Alpha Brain is a nootropic that supports memory and focus. This was not added to fulfill a lack of vitamin, just an addition to the group. To conclude, I am no way throwing shade on the vegan diet. A lot of the time, we lean towards a junk food vegan diet and these vitamin supplements keep us meeting out dietary goals. I also forgot to mention why we order specified vegan vitamin supplements. As some people may not know, many vitamins contain gelatin, which is not vegan. Be careful when ordering your supplements. With the approach of spring in Philadelphia and all its wonder, I would like to take some time to point out a few of my new found favorite things popping up all over the city. Miyoko’s cashew based cheeses recently entered my life when friends of mine were kind enough to pick some up while visiting Lagusta’s Luscious in New York. Until this moment, I did not know what I was missing. Since then I have tried nearly all the varieties, savoring each block then waiting for my next chance to get another. It has never been available in Philadelphia which set up a road block on my highway to vegan cheese glory. While shopping at Whole Food’s South Street, I nearly fainted in the dairy (free) isle. This Philadelphia location now carries Miyoko’s Double Cream Chive ($8.99) and Aged English Sharp Farmhouse ($9.99). I purchased the Double Cream Chive and now I do not know how I will live without it. It’s rich, creamy flavor fulfills any pre-vegan cheese dream I ever had. Whether you plan to throw a vegan wine and cheese party or just indulge is some cheese on toast, you will want to pick up both of these delectable cheeses. Not to begin on a negative note but I have always had a bone to pick with the Philadelphia Pretzel Factory and their need to use whey in their pretzels. I not only ate one of these pretzels myself before doing my research, but I have also had to correct other people on a vegan diet of this unnecessary ingredient in the well-known Philadelphia staple. So let’s talk about a company who does not put unneeded ingredients in their pretzels: Center City Soft Pretzels. Seeing a Center City Soft Pretzels immediately reminds me of my childhood, specifically, recess in grade school. It is funny how a pretzel could bring you back to a time when your biggest worry was finishing your homework in time to go to the playground. These three-ingredient, kosher bundles of joy are just perfect. Since recently moving onto Richmond Street in Port Richmond, I am lucky enough to be in walking distance of the River Wards Café, an establishment serving up Center City Soft Pretzels daily. (TIP: Get there at 8:15 am and the pretzels will still be warm.) So stop by and get your carb on. The lattes are not that bad either. Center City Soft Pretzels are also available around the city of at their factory in South Philly. Oh, almond milk and all this dairy-free goodness. The past two months have been very almond-y for me. In the beginning of February, my vegan runner enthusiasm came to a screeching holt when I was unofficially diagnosed with a stress fracture. After taking a careful review of my calcium intake, I found out I needed A LOT more than I was getting. Since almond milk is a huge source of calcium for vegans, I did my research on all the commercialized milks and their calcium content. Quite frankly, I was too lazy to make my own almond milk at home. It was really hard to settle on an almond milk that was organic, non GMO, and did not contain carrageenan until Origin Almond popped in my inbox. 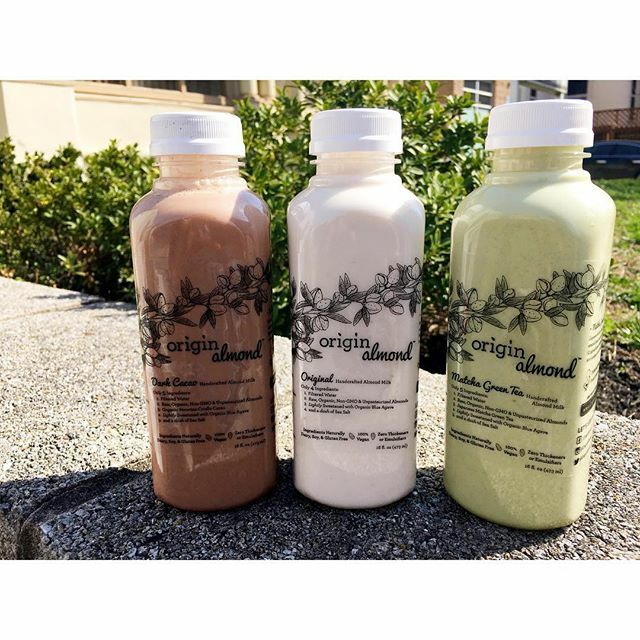 Origin Almond is a localish (New Jersey) company that makes 100% raw and unpasteurized almond milk. Their flavors vary from plain old almond milk to a Golden Tumeric blend. Not only do they use organic almond, they are also GMO and additive free! As if things could not get better, ONE 16 oz bottle of Origin Almond Milk contains the almond equivalent of TWO commercial cartons of almond milk. ABSOLUTELY AMAZING. Origin Almond can be ordered online and delivered to your door (like the olden times) OR it can be found at Essene Market on 4th Street. The wait is OVER. Dottie’s Donuts finally opened up its brick and mortar location in West Philly. 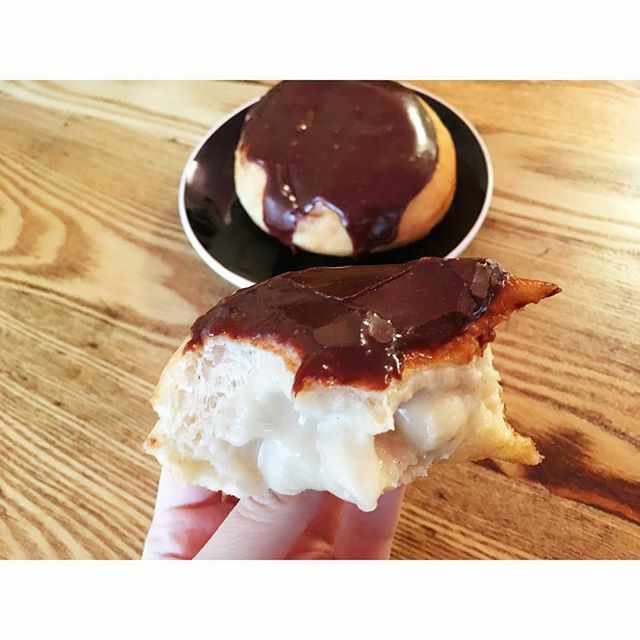 On that day, the heavens opened up and sent down the Dottie’s Boston Crème Donut for all of the people of Philadelphia to enjoy. I have no further words about it. Just go. Try one for yourself. You’re welcome. As if Front Street Café could not get even better in my mind, THEY DID. If you have not been to Front Street Café you are missing out on a lot. 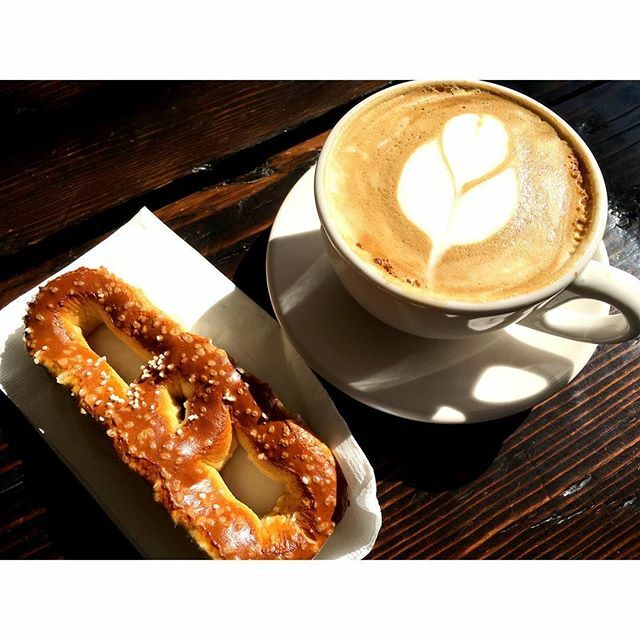 The café/restaurant hosts a ton of vegan Philly favorites including Crust Vegan Bakery and Dottie’s Donuts (not so fast, you still can only get the Boston CrèmeS at THEE Dottie’s Donuts in West Philly) along with juice, smoothies and bagels. Their sit down brunch and dinner menu is on point, carrying everything from pancakes and buffalo cauliflower to their version of vegan eggs benedict. All this is great and delicious. But then there is the Kale Caesar salad.. 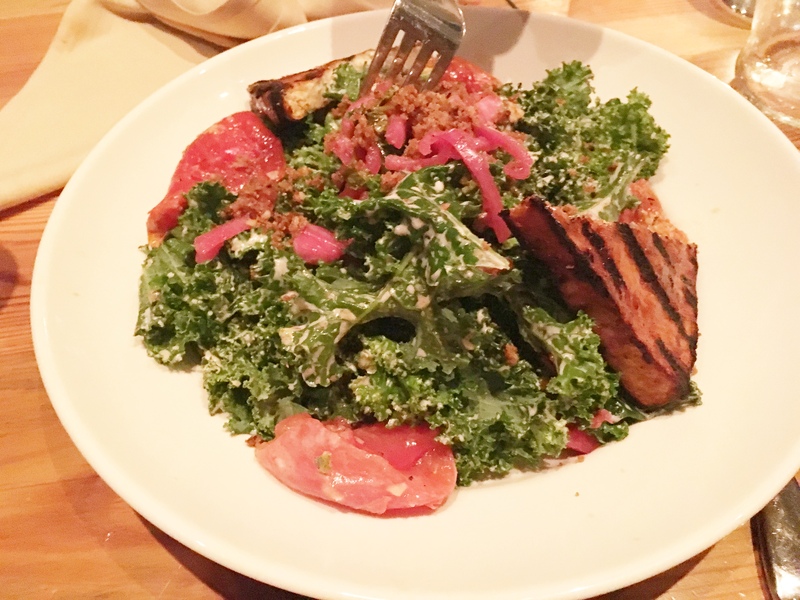 Skeptics out there would think “what is so great about a kale salad?” Skeptics have never tried THIS kale salad from Front Street Café. Again, just go. Try it. I have never tasted something so healthy yet delicious. OH! Do not be fooled by the Front Street Café menu. Instead of placing a symbol next to vegan menu items, Front Street places symbols on items that are not vegan! So go crazy and order anything without a cow, pig, chicken or cheese wedge next to it.